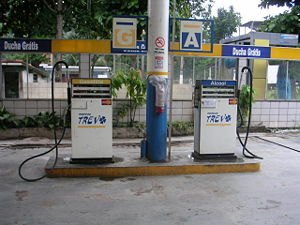 A filling station in Brazil offers both gasoline (left) and alcohol (right). Fuel is any material that is burned or altered to obtain energy. Fuel releases its energy either through chemical means, such as combustion, or nuclear means, such as nuclear fission or nuclear fusion. An important property of a useful fuel is that its energy can be stored to be released only when needed, and that the release is controlled in such a way that the energy can be harnessed to produce work. All known life forms, from microorganisms to humans, depend on and use fuels as their sources of energy. Their cells engage in enzyme-mediated chemical processes collectively called metabolism, which converts energy from food or solar power into a form that can be used to sustain life. Additionally, humans employ various techniques to convert one form of energy into another, producing usable energy for purposes that go far beyond the energy needs of a human body. The application of energy released from fuels ranges from heating to cooking and from powering weapons to the generation of electricity. All currently known fuels ultimately derive their energy from a small number of sources. Fossil fuels, for example, are thought to have been formed from the remains of living matter, which received its energy from the utilization of solar energy through photosynthesis. Solar energy, in turn, is generated by the thermonuclear fusion process at the core of the Sun. The radioactive isotopes used as fuel to power nuclear plants were formed in supernova explosions. Chemical fuels are substances that generate energy by reacting with substances around them, most notably by the process of oxidation. 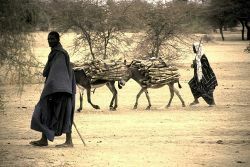 These substances were the first fuels to be known and used by humans and are still the primary type of fuel used today. Wood was one of the first fuels used by humans and is still an important energy source in much of the world. Biofuel can be broadly defined as solid, liquid, or gas fuel consisting of, or derived from biomass. Biomass can also be used directly for heating or power—known as biomass fuel. Biofuel can be produced from any carbon source that can be replenished rapidly, e.g. plants. Many different plants and plant-derived materials are used for biofuel manufacture. Perhaps the earliest fuel that was employed by humans is wood. Evidence shows controlled fire was used up to 1.5 million years ago at Swartkrans, South Africa. It is unknown which hominid species first used fire, as both Australopithecus and an early species of Homo were present at the sites. As a fuel, wood has remained in use up until the present day, although it has been superseded for many purposes by other sources. Wood has a relatively low energy density of 10–20 MJ/kg, which is less than half that of gasoline. Recently biofuels have been developed for use in automotive transport (for example E10 fuel). Coal rail cars in Ashtabula, Ohio. Fossil fuels are hydrocarbons, primarily coal and petroleum (liquid petroleum or natural gas), thought to be formed from the fossilized remains of dead plants and animals by exposure to heat and pressure in the Earth's crust over hundreds of millions of years. In common parlance, the term fossil fuel also includes hydrocarbon-containing natural resources that are not derived entirely from biological sources, such as tar sands. These latter sources are properly known as mineral fuels. Modern large-scale industrial development is based on fossil fuel use, which has largely supplanted water-driven mills, as well as the combustion of wood or peat for heat. With global modernization in the twentieth and twenty-first centuries, the growth in energy production from fossil fuels, especially gasoline derived from oil, is one of the causes of major regional and global conflicts and environmental issues. A global movement toward the generation of renewable energy is therefore under way to help meet the increased global energy needs. The burning of fossil fuels by humans is the largest source of emissions of carbon dioxide, which is one of the greenhouse gases that enhances radiative forcing and contributes to global warming. The atmospheric concentration of CO2, a greenhouse gas, is increasing, raising concerns that solar heat will be trapped and the average surface temperature of the Earth will rise in response. Nuclear fuel is any material that is consumed to derive nuclear energy. Technically speaking, this definition includes all matter because any element will under the right conditions release nuclear energy. In practice, the only materials commonly referred to as nuclear fuels are those that will produce energy without being placed under extreme duress. 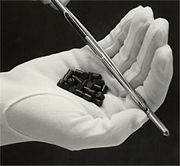 Nuclear fuel pellets are used to create nuclear energy. The most common type of nuclear fuel used by humans is heavy fissile elements that can be made to undergo nuclear fission chain reactions in a nuclear fission reactor; nuclear fuel can refer to the material or to physical objects (for example fuel bundles composed of fuel rods) composed of the fuel material, perhaps mixed with structural, neutron moderating, or neutron reflecting materials. The most common fissile nuclear fuels are 235U and 239Pu, and the actions of mining, refining, purifying, using, and ultimately disposing of these elements together make up the nuclear fuel cycle, which is important for its relevance to nuclear power generation and nuclear weapons. Fuels that produce energy by the process of nuclear fusion are currently not utilized by man but are the main source of fuel for stars, the most powerful energy sources in nature. Fusion fuels tend to be light elements such as hydrogen which will combine easily. In stars that undergo nuclear fusion, fuel consists of atomic nuclei that can release energy by the absorption of a proton or neutron. In most stars the fuel is provided by hydrogen, which can combine together to form helium through the proton-proton chain reaction or by the CNO cycle. When the hydrogen fuel is exhausted, nuclear fusion can continue with progressively heavier elements, although the net energy released is lower because of the smaller difference in nuclear binding energy. Once iron-56 or nickel-56 nuclei are produced, no further energy can be obtained by nuclear fusion as these have the highest nuclear binding energies. Scientists think that the first use of fuel was the combustion of wood or sticks by Homo erectus about two million years ago. Throughout the majority of human history, fuels derived from plants or animal fat were the only ones available for human use. 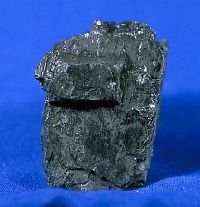 Charcoal, a wood derivative, has been used since at least 6000 B.C.E. for smelting metals. It was only supplanted by coke, derived from coal, as the forests started to become depleted around the eighteenth century. Charcoal briquettes are now commonly used as a fuel for barbecue cooking. Coal was first used as a fuel around 1000 B.C.E. in China. With the development of the steam engine in 1769, coal came into more common use as a power source. 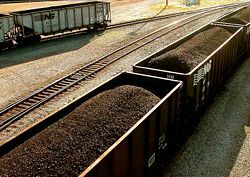 Coal was later used to drive ships and locomotives. By the nineteenth century, gas extracted from coal was being used for street lighting in London. In the twentieth century, the primary use of coal is for the generation of electricity, providing 40 percent of the world's electrical power supply in 2005. ↑ Rincon, Paul. 2004. Bones hint at first use of fire BBC News. Retrieved January 13, 2008. ↑ Elert, Glenn. 2007. Chemical Potential Energy The Physics Hypertextbook. Retrieved January 13, 2008. ↑ Novaczek, Irene. Canada's Fossil Fuel Dependency Elements. Retrieved January 13, 2008. ↑ Fossil fuel EPA. Retrieved January 13, 2008. ↑ Fewell, M.P. 1995. The atomic nuclide with the highest mean binding energy American Journal of Physics. 63:7:653-658. Retrieved January 13, 2008. ↑ Hall, Loretta. 2007. Charcoal Briquette How Products Are Made. Retrieved January 13, 2008. ↑ History of Coal Use World Coal Institute. Retrieved January 13, 2008. This page was last modified on 26 January 2016, at 16:57.